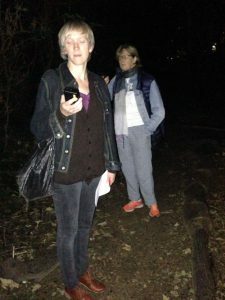 Last night we realised we hadn’t had a bat walk this year and so a small group of us went out with the bat detectors to see what we could find. We walked round DKH Wood, through Green Dale, down the Green Dale path, along the bottom (via the path that links Green Dale to Abbotswood Rd) and then back to DKH Open Space by the Sainsburys car park. Along the way we found the usual suspects: pipstrelles and noctules. These were found in the wood, along the Green Dale path (where we saw them) and along the path that links the Green Dale path with Abbotswood Rd. This last path seems to always have bats, especially noctules and inf act we stood there for a while watching them fly above us catching insects in the lamplight.